Check iqama expiry date online by clicking on red link a very easy step. This is just two steps procedure. 1. click on red link. 2. enter your iqama number. Saudi Government has launched most of the services online for expatriates. And now if you want to check any detail about you, you can check it online very easily. 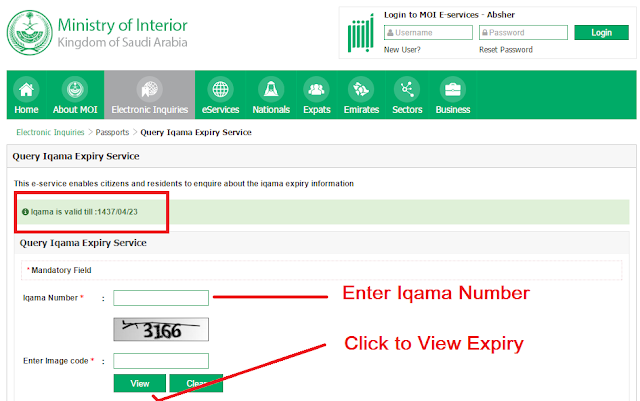 In this post follow the below simple steps to check iqama expiry date. Now click on above red color link and follow these steps to check iqama expiry date. 1. Now Enter your iqama number. After these easy steps you can check iqama expiry date online as below shown in picture. 1. Write www.moi.gov.sa in Google.com or you can click direct on red link. 2. After website open select your language english. (you can choose it from top left corner). 3. Now click on Electronic inquires tab and then click on Passport in sub menu and now find "Query Iqama Expiry Services". 4. Now write your iqama number as above picture mentioned. 5. Enter Image Code in second box. 6. Click on View and you are done. Iqama is Valid till: YY/MM/DD (Expiry date will in hijri). Iqama expiry date status and validity check post is very helpful. Every one can directly open link of moi website from here.